Kristin Dewitt Female Fighter NAAFS Debut Kristin Dewitt will face Summer Artherton at NAAFS at Columbus, Ohio on July 9th. This will be Kristin’s amateur debut. Summer is taking this fight on short notice. Kristin graciously accepted to answer a few questions before the fight. Fightergirls: Hi Kristin. Thanks for taking the time to answer a few questions for Fightergirls.com. Kristin: No worries, I’m quite stoked actually!!!!!! Fightergirls: You are fighting on NAAFS’s Caged Vengeance 7 in Columbus, Ohio on July 9th. This will be your amateur debut. How long have you been training for this moment? 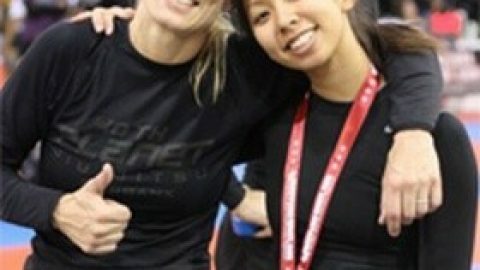 Kristin: Actually I’ve been training for this for a bit, probably about a year and a half to two years in MMA and about 3 yrs in other martial arts. I can’t wait though. I get to fight in front of friends, my family and my brother before he goes off to college. I’m also excited I’m on the card with two of my teammates; we plan on putting a great show. Both are amazing fighters and entertainers. I can’t wait to follow in their foot steps. FG: Have you competed in any amateur tournament such as grappling or boxing? Kristin: Nope none of those, [he he] I did fight at G-fight 2010, but its not counted on my record. It was a ton of fun and a great way to get my feet wet. FG: How important has support of friends and family been to you? Kristin: The support from my friends was a major factor in why I do what I do. They always accepted it, kids I graduated with was not surprised. The guys enjoyed wrestling around with me at the park, especially because they could just pick me up and put me where they wanted to. I’m from a very conservative family. My mom who was raised as a strict catholic, she believed that fighting was a guy’s world. My dad was the same, so when I started doing tae kwon do and kickboxing, for the first few months was trying to keep my double life a secrete. I even told my friends not to mention it around them. When they did find out, they were in shock; my dad even asked me if I wanted to be a boy, I just laughed. After a few years of my brother, my coach and I trying to convince them, they are finally coming around, especially after my mom had a long talk with my coach and found out I wasn’t going to get really badly hurt. The days of keeping my secret world were over. FG: Your original opponent has withdrawn from the fight. How hard is it to be training a week out and not know who you are going to fight? Kristin: First I want to send my get well wishes to her and I can’t wait till we get to fight each other, it will be a good one. Ok to answer your question, it’s not really a big deal. I just train my hardest, work one everything, both standup and ground, even wrestling even though I hate it. Just so I’m well rounded incase I run into a problem, I’ll have the tools to solve it. The worst part about this though, is I don’t know if I’ll even get to fight, which would totally bum me out. Kristin: Ummmm back when I would watch the old school power rangers. [He He He] No but really it kinda just fell into place. After going through really really bad times with my mental state and suffering from PTSD and developed a horrible temper. I kinda just stumbled on it after watching old female boxing and muay thai fights. I thought I could do that, I’ve always been a tom boy and love watching fights and wrestling around with my guy friends. I thought this would be a perfect fit, and a great coping skill. I hardly was motivated about anything, my art, my music and writing, especially school. 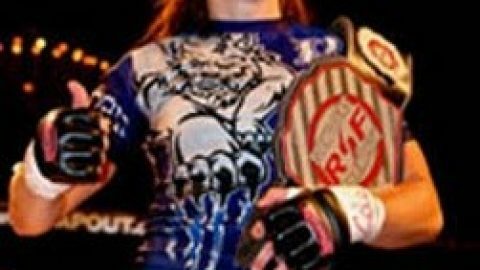 But this was different, I was in love and driven, I was determined to make a name for myself in women’s MMA. The only problem was getting around my parents. I’d have an old friend take me to the gym and he’d have to convince me to keep with it when I wanted to quit. Now I train 4 to five days a week. I sweat, bleed and get awesome mat burn and bruises! I get picked on and rolled in a ball by my guys on my team. I keep on soaking up every thing I can. I honestly couldn’t have a better team, who will make me an awesome fighter! FG: You recently returned from vacation. Is it easy to continue training while in Columbia? Kristin: First it was totally cool to see where you are from. The altitude was different than Ohio, so it was even hard to just walk around. We did a lot of walking and climbing up the mountains. One of my team mates, my BJJ coach kept bugging me to keep up with my basic workouts, Which I did, yay for the crunches from hell and pushups, which I hate, plus other fun stuff. So when I got back I was all ready to go, plus the trip was relaxing and the fight was hardly on my mind, well minus not knowing if I had an opponent or not. FG: Aside from mixed martial arts, what other hobbies interest you? Kristin: Uhhhh good question, I love to have movie night with my best friend and watch cheesy b-rated horror movies where we comment and make fun of them all. I loved to draw but I haven’t lately. Same with playing my flute. I enjoy spending time with my friends and goofing off. I do love to hangout with my family. O I’m obsessed with NCIS. I love Gibbs. And of course, facebook stalking he he he. FG: If you were giving advice to another person who wanted to fight, what would top the list of things they should do? Kristin: Chill out the worst that can happen is you get hit or go to sleep, but you’ll be ok. Try it if you like it come back, if not at least you won’t be kicking yourself cause you didn’t even try. FG: Is there anything you would like to say in closing? Kristin: Do what you love and don’t let any one stop you, its your life and you only get one so live it up. Chase your dreams and don’t stop till you finally reach what you been chasing. In the end, the Chase makes everything worth while! I’d like to thank my team! Everyone at Walker Mma, they have been so awesome and accepted me as part of their family. My training partners who make me a better fighter especially when they beat me up and roll me into a ball. My coach Walker who has taught me so many things about the sport and life especially through rough times. My friends who always supported me and took all my abuse when I wanted to practice. Also all the great people I have met during my mma journey. Oh and my family who are starting to come around, especially my brother who always believed in me. Big thanks to my sponsors, tufchik gear and especially TUSSLE, they are awesome and some of the nicest people in the mma world and they make you look Good! And of course to NAAFS and Niki for making this happen. 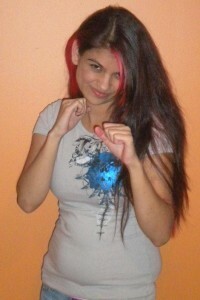 A huge thanks to fightergirls.com for letting me do this interview. I’m honored.